Sending a gift can make someone's day and leave a lasting impression! It's a great way to celebrate a milestone, complete with a client, thank a referral partner or honor a special relationship. Here are some of our favorites! 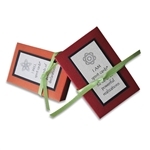 I AM or I WILL Spirit Cards are delicate reminders of the powerful message of self-remembrance. Release old patterns of thinking, remember our true Spirit nature and the sacred in every day. Nurture your body, mind & soul. These richly layered guided meditations for morning noon and night combine Breathing, Coaching, Meditation and Yoga so you can be Clear, Calm & Bright all day long. Turn passionate ideas into profitable enterprises with the fun and accessible approach outlined in The Right-Brain Business Plan: A Creative, Visual Map for Success by Jennifer Lee. This is not business as usual! 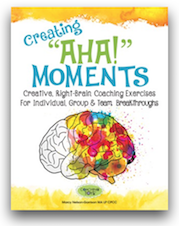 Each page has an encouraging message while the opposite page has a question relating to that message.This is a great book for your clients to process the stages and challenges of going after a dream. 5x5 spiral bound book. Improve your health & performance in minutes a day! With over 80 different ways to relax & refresh, The Mini-Retreat Solution will show you how to weave moments of deep relaxation into your day - no matter how busy you are. Described as “Tuesdays with Morrie meets Georgia O’Keeffe,” The Grace of Ordinary Days, by poet Kay Saunders and nature photographer Bernie Saunders, is a rare glimpse into the separate but inseparably linked lives of a mother and son.